Upset about the election result and wanting to act, Cheetah McClellan was excited to learn that women from across the country were planning to march on Washington, D.C., the day after Donald Trump’s inauguration. Then she checked out prices on flights and hotel rooms, and remembered she was earning a beginning teacher’s salary. Maybe, she thought, Denver ought to have its own women’s march. After searching fruitlessly online for anyone planning such a thing, McClellan created a Facebook event page, shared it with some left-leaning social media sites and waited. By the next morning, 800 people had signed up for an event that was more of an idea at that point. Not long after, McClellan connected with a couple of similarly inspired local women — Karen Hinkel and Jessica Rogers — and plans for the Women’s March on Denver began to take shape. 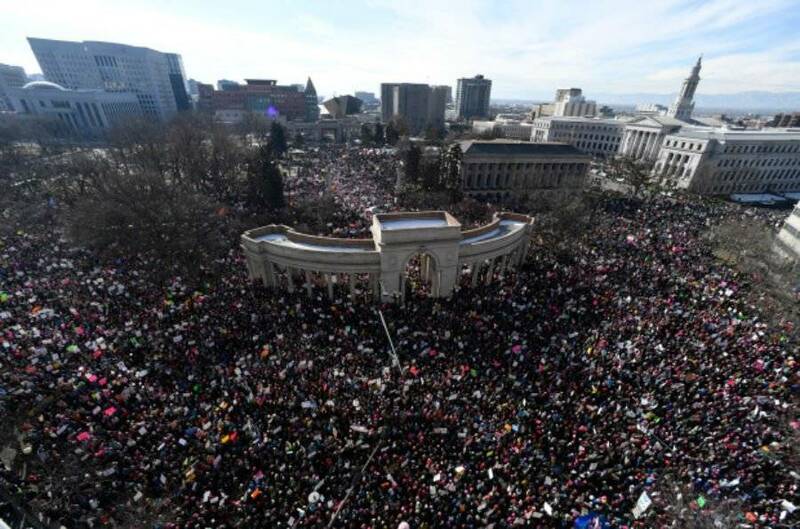 On Saturday, a larger-than-anticipated crowd of more than 100,000 filled Denver streets and Civic Center Park in a display of what organizers described as a united front for equality and women’s rights after Trump’s ascension to the White House. Cheetah McClellanStan ObertMcClellan, 42, came to teaching later in life after working as a bartender, waitress and astrologer who did readings and wrote a column about astrology, she said. McClellan completed her teacher licensure through a University of Colorado Denver residency program, and is now pursuing a master’s in culturally and linguistically diverse education. This school year, McClellan is doing math intervention work on a one-year contract at Colfax Elementary School in Denver, which has a large number of Latino students living in poverty. 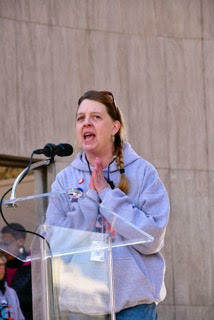 We caught up with McClellan after the march she helped lead. This interview has been edited for brevity and clarity. Life just kind of pulled me in that direction. I was volunteering at my kids’ school, doing writing groups with kids. The school secretary said, “Do you want a job?” So I became a paraprofessional. Then I decided I wanted to be a teacher. Why did you invest so much energy in the organization of this march? What motivated you? I have always considered myself to be politically aware and informed. I’ve always voted, I try to be vocal and have conversations with people. But I never was super-active. Last year, I was doing student teaching for my residency. Even before Trump was the (Republican) nominee, kids were scared. I was working with fourth graders, and literally every single day a student would ask me a question about Trump that revolved around fear. “Will they really deport us? Will my mom and dad have to go back to Mexico?” While we want students to be aware of politics, they were not just aware of it, they were emotionally affected by it. They were scared. That just really bothered me. The day after the election, the whole fifth-grade class was sobbing. My son has Asperger Syndrome. So when Trump mocks a disabled person, it irks you. My daughter identifies with the LGBT community. She said she was so scared. All this got me mad. Have you brought any of your work organizing the march into the classroom, used it in your teaching in any way? Some of the kids know what I’ve been doing. But it’s not something I have been able to discuss in more of an academic way. Moving forward, I am actively looking for a teaching position next year and I’m definitely excited to bring this into the classroom — especially in Colorado, where we have such a rich history of the women’s movement. I don’t think a lot of people realize that. Continuing to empower girls at the same time educating boys that empowered girls are not a threat: That’s how I’d like to incorporate it into the classroom. This is definitely something that is not ending. We are working to create a nonprofit organization out of this. We want to move forward with it but we’re not sure exactly how it’s going to look like at this point. I am hoping it becomes a platform for community networking and — as I have called it — legislative meddling. We want to make sure we have an impact on laws and the legislative process as citizens. Beyond that, on a broader level what do you hope will come out of the energy and enthusiasm? I hope to see people just continue to be active in their community. We’ve gotten into a bad habit of hiding behind our keyboard, hiding behind social media. We have tensions in our communities. We still have a lot of racial tensions in our communities. What you saw Saturday was all these different people coming out because they care about a central issue. We have to continue that — to try to find opportunities for people to sit in the same room together and work together on issues they care about. The march was a sea of signs. Did you have a favorite? What do you say to those who think the marches are sour grapes about a lost election, and that this ultimately won’t make any difference? I would say, look at the history books. Take a class on civics. When Martin Luther King Jr. gave his “I Have a Dream” speech, that inspired John F. Kennedy to take a different approach to the civil rights movement.On Saturday, we had numerous state legislators marching with us and on stage. It sends a strong message to those in power. And it also unites the community. OK, I need to ask. Is “Cheetah” a nickname? Where did that come from? It’s an old bowling nickname. It has been around for about 25 years. That’s who I am. One of the larger messages I’d like to pass along is you don’t have to be someone special or a board member or a politician to impact real change in your community. You just have to be a little bit brave and a little bit crazy.